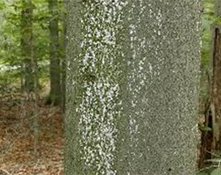 HOST PLANTS: Beech Bark Disease can be found on both European and American Beech trees. The fungus may occur in either its sexual or asexual stage. 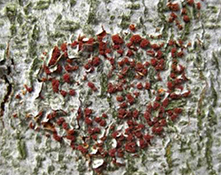 The sexual stage forms tiny, red to salmon-coloured fruiting bodies on the trunk. 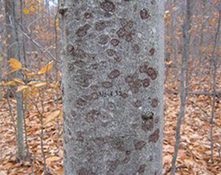 The asexual stage forms white cushions of fruiting bodies that look similar to beech scale. Bark invaded by the fungus is killed. A reddish-brown fluid may ooze from dead spots in the trunk. Beech scale colonies can’t live where the bark has been infected by the fungus and disappears from those areas. Foliage on branches above killed bark may become sparse and chlorotic, wilt suddenly and turn brown or at times show no symptoms. This disease results from the invasion of a fungus into areas of bark that have been infested with beech scale. At least two species of Nectria fungus may be associated with the disease. The scale insect is yellow, oval and about 0.5 to 1.0 mm long. Overwintering nymphs are covered with wooly, white strands of wax. They molt in spring and lay eggs in mid-summer. Eggs hatch from late summer to early winter, and crawlers migrate to other parts of the tree or are transported by wind to other beech trees. Once crawlers settle, they feed by inserting their stylets into the inner bark. The crawlers prefer areas of bark that are rough, such as cracks and crevices. Tiny injuries caused by feeding provide wounds for the fungus to enter. Left untreated, the disease may be fatal. Eliminating the scale insects controls the disease. Look for beginning scale infestation on the trunk of large trees, often near branch stubs or other rough areas. Remove scale insects from the lower part of the tree by brushing with a soft brush or by using water from a high-pressure nozzle. If horticultural oils are used, apply them only when the tree is dormant. Avoid moving beech logs or firewood from infested stands to unifested areas from late summer to early winter (beech scale crawler stage is active) to help stop the spread of the disease.